Today's the 50th Anniversary of the MINI Cooper. What better way to celebrate than revealing a concept car? This is it. 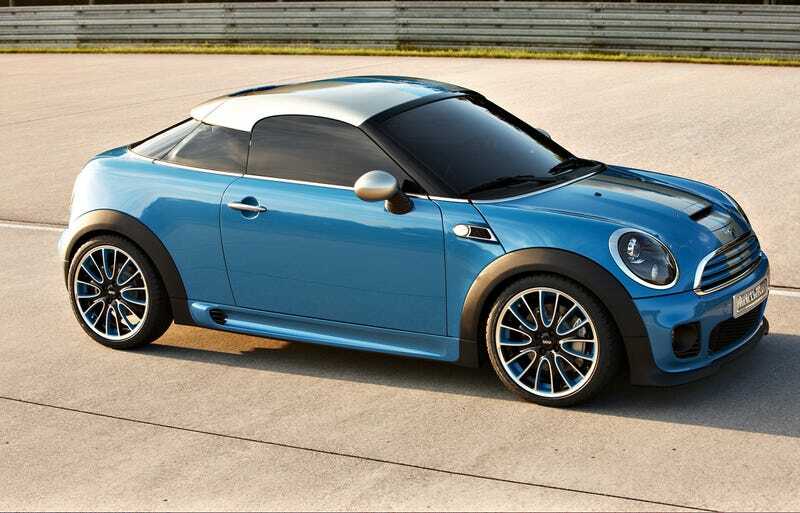 It's the MINI Coupé Concept and it dispenses with all but the basic fundamentals of what makes MINI great. All pretenses of a rear seat are gone with the Coupé Concept and the two-seater's designed to accommodate even the most powerful engine currently available in the MINI –- and with the 1.6-litre twin-scroll turbocharged power unit carried over from the MINI John Cooper Works, the MINI Coupé Concept offers truly outstanding performance. Maximum output is 211 HP, with peak torque of 192 lb-ft increasing through the Overboost function to an even more substantially front wheel-squealing 206 lb-ft. Full press release below ahead of us seeing it live in the two-door flesh in Frankfurt. Concentrated Driving Pleasure: The MINI Coupé Concept. providing a new feeling of go-kart driving.